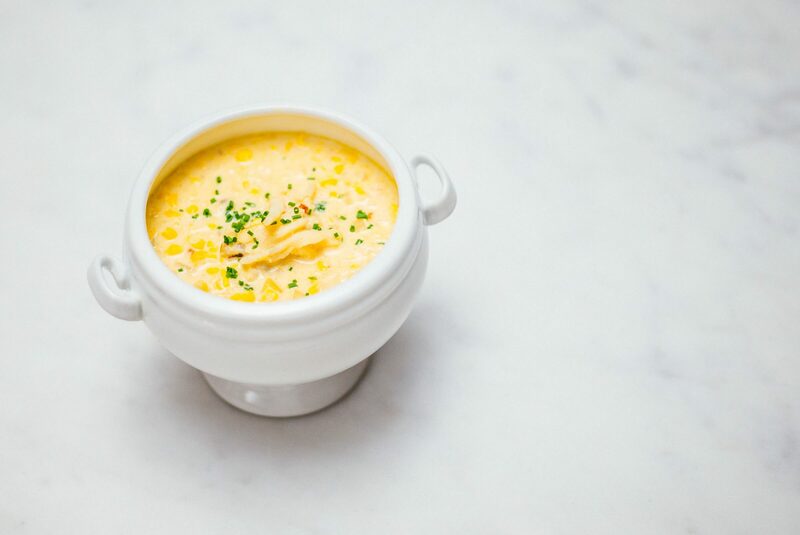 The rainy weather we’ve had the past few days has really put us in the mood for fall comfort food. We wanted to make a Friday night date night dinner last week. We headed to Whole Foods without much of a plan, but after making a couple of rounds around the produce section, we had the idea to braise a pork shoulder in white wine with lots of onion, fennel, and seasonal herbs. This is not something we’ve made before, but it sounded good enough, so we gave it a try. It was really simple; anyone can make this at home. We got a small piece of boneless pork shoulder roast, rubbed it with salt and pepper, and seared it in a small dutch oven. The key to searing meat on the stove is to be patient and not disturb it so that it develops a good crust. We used the time to open the bottle of Petit Chablis we had purchased to braise the pork in and make sure it was good. After adding the vegetables and herbs (see details below), we just let it simmer away on low until the meat was fall-apart tender. Not that it needed it, but we tossed a pat of Italian butter into the braising liquid and let it reduce a bit into a nice sauce. The result was amazing! 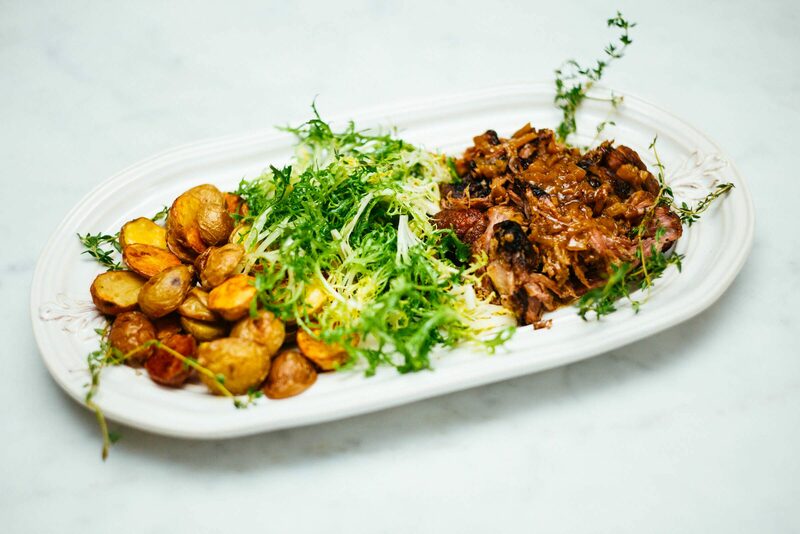 We didn’t want to bring the whole pot over to the table, so we arranged some of the braised pork on a platter with some simply dressed frisee greens and roasted potatoes. If you’re cooking for more than two, add these brussels sprouts baked in stilton and creme as an additional side. We got this platter (without the gold detail) a few months ago for a special project and it’s become one of our favorite pieces for entertaining. It’s pretty, and dishwasher safe. It also fits in the dishwasher, which some platters don’t. We like it so much, we’re thinking it might be a great holiday gift this year. Rub the pork shoulder on all sides with salt and pepper. Sprinkle a pinch of flour sparingly over all sides to help the meat brown. Wondra flour works best for this, as it does not clump. 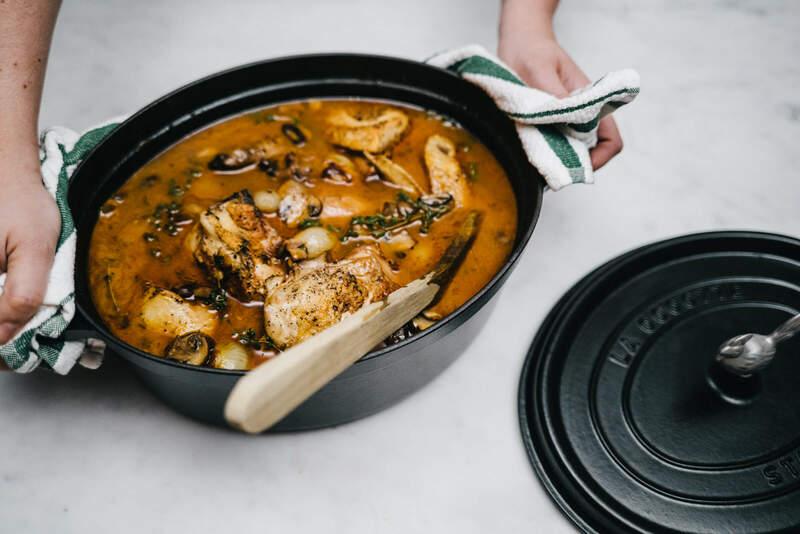 In a dutch oven, heat enough oil to just coat the bottom of the pan in a dutch oven over medium heat. 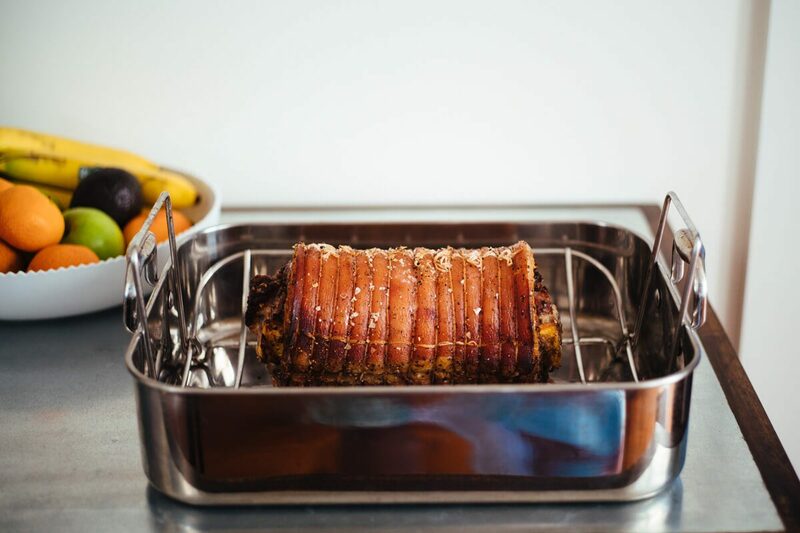 When the oil is hot, brown the pork shoulder on all sides, then remove to a plate. Reduce the heat slightly and add the fennel and onion. Cook, stirring frequently, until it it is soft and beginning to color. Add the white wine to the pan, then return the pork shoulder to the pan, along with 2-3 sprigs each of sage and thyme. If necessary, add enough vegetable stock to cover the roast by half. Cover, reduce heat, and simmer over low heat for 2-3 hours, or until the pork easily comes apart with a fork. To finish, remove the pork and herbs from the pan, and increase the heat slightly. Allow the cooking liquid to reduce slightly, and spoon over the meat prior to serving.